Meet at Central Liquors, a fine wine, beer and spirits venue located just in the vibrant Penn Quarter District of Washington DC. Here, whet your palate by sampling an assortment of their promotional wines or liquors. Depending on the day, you may try wines from Spain and Argentina – three whites and three reds – or sample the specially selected liquors of the day.After about 15 minutes here, hop aboard a pedicab and let your guide take you on a 40-minute tour of Washington DC. Sit back, relax and enjoy unobstructed views of DC as you journey effortlessly through the city streets. Pass under the Friendship Arch, see the Verizon Center, visit Chinatown and cruise through the Federal Triangle.Delve into the history of Abraham Lincoln’s infamous assassination as you pass the Old Mary Surrat House, where conspirators stayed during the planning of his murder. See Ford Theatre, where Lincoln was shot, and the Peterson House where he died. Then pass through the alley that John Wilkes Booth escaped through on horseback.You’ll also see the National Portrait Gallery, a historic art museum that’s part of the Smithsonian Institution. Other cultural attractions include the International Spy Museum and the world-famous Madam Tussauds wax museum. At the end of your tour, your guide will drop you off at the metro station of your choice so you can continue exploring on your own.Tasting On the Go This popular option lets you take your wine tastings on the go! 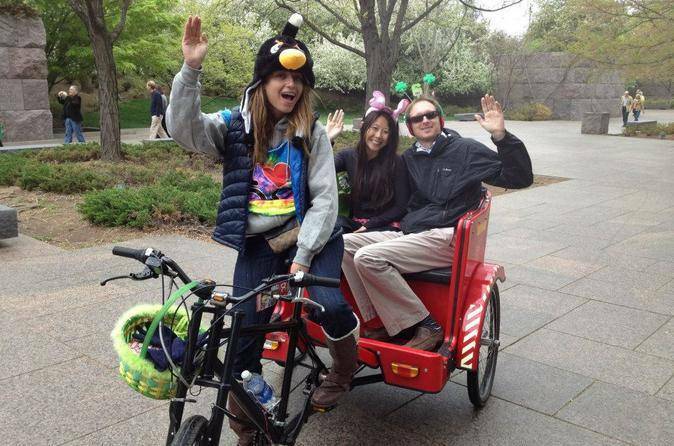 Instead of doing your tastings at the Central Liquors venue, you'll be given a bottle of wine to drink inside the pedicab as you see the sights of DC.